In European Blackjack, you know the dealer will stand on all 17s. You may split any pair, including aces, and all split hands receive only one more card each. Split aces that receive a face card or a 10 do not become blackjack – they are counted as 21. You cannot re-split under any circumstances. Should you choose to double down you may do so, so long as the point value of your original cards totals 9, 10, or 11. You may not double down after a split, or if you have been dealt blackjack. Insurance is available so long as the dealer is showing an ace, at a cost of one half your initial bet. You cannot surrender in this game, so don’t even try! In European Blackjack your initial bet is constrained to a range of 2-200 USD/GPB/Euro. All wagers are made using chips in denominations of either 2, 5, 25, or 100. When you win a hand, your payout depends on the type of win. 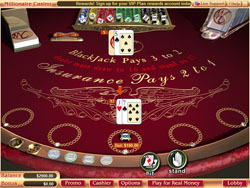 Blackjack pays 3:2, and all other wins pay even money at 1:1. Insurance bets pay 2:1 if the dealer in fact has blackjack. All bets push in the event of a tie. When you first load a Vegas Technology’s Blackjack game, your immediate reaction will be: “WOW!” If you have already played one before, you will know exactly what we mean. This game looks fantastic. The table is red velvet with gold inlays and a polished oak rim. The gleaming chip tray and card shoes populate the top half of the screen. When you deal, cards fly magically out of the shoe into perfect alignment on the table. You can turn off the animations if you have an older machine, but they don’t slow things down very much. The game is great on the eyes, and very easy to play – you will never be left wondering where to click next! Don’t just split on a whim – follow a specific strategy. Here is some advice you might choose to follow when splitting. Never split 4s, 5s or 10s, and always split aces and 8s. As for the rest of the pairs you can get, only split those if the dealers face up card is 6 or less, otherwise leave them be and just play the hand. These are not strict rules, but guidelines to help you figure out what to do. Good luck! Vegas Technology might not be the biggest player in the online casino business, but they have a whole lot going for them judging by their European Blackjack game. The graphics are truly beautiful, and the gameplay is as smooth as can be. Plus this game offers you standard rules, and the ability to play up to five hands at once against a single dealer hand, which can often times give you a slight edge. European Blackjack is most definitely a winner!